For the last week I have been excavating a Mamluk-era barrel vault, previously excavated in 2004 and 2005. After cleaning out tons of limestone blocks used as backfill, we started to try to sort out the major architectural features in the building—in particular there’s a mysterious cistern, which was cut in the northern wall that I’m itching to investigate. While trying to clear some of the caved-in ceiling (and upper floor) from the barrel vault, I found a nice little fire pit, dug right next to the east wall and full of charcoal. We sampled the charcoal extensively, and I started to excavate the feature. From the top the fire pit was circular in shape, but as I went deeper it became obvious that the people who dug the pit couldn’t be bothered to move the same rock tumble I was struggling with. This fire pit was dug after what we call the primary occupation of the site—the structure was used opportunistically by people who appear to have had a bit of goat for dinner, judging by the nearby bone and tooth I found. We’ll know better when Alan sorts out the phytolith and flotation samples that we took. He’s looking for evidence of plant remains to determine ancient climate and regional diet. So these people who dug the pit chose the very northeastern corner of the building, which is quite far away from what we think was the door. Yet at this time, the building had at least caved-in partially, as the fire pit intrudes into a collapsed layer. The fire pit was also quite small, measuring only about .3m x .3m x .3m deep and the area near the fire was only large enough for one person to cook. 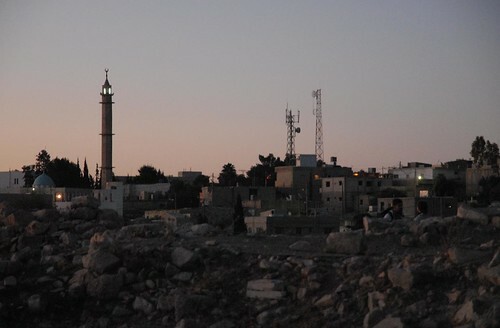 The town of Dhiban is situated on the next tell over, and it is cacophonous, full of shouts and dogs barking, calls to prayer at all hours (including 3am), welding, sirens, you name it. I began to wonder if the tell site of Dhiban was once the same way, noisy and full of mayhem. But I also know that it was not always this way, that Dhiban has been through periods of occupation and near abandonment, and I wonder if the fire pit was built during one of those quiet times, a single line of smoke dividing the evening sky, and a very small group, perhaps only one person, standing in the Roman, Byzantine, and Mamluk ruins and enjoying the view of the wadi and the night sky.